his dog in his Holiday cards. 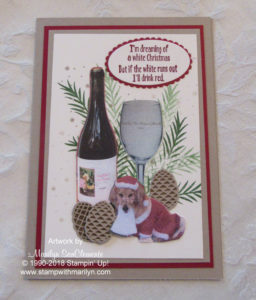 He actually saw a card made with the Half Full and the Christmas Pines stamp sets last fall and said that he wanted to design something with his precious dog and the wine set. He and some friends had made wine and named it after Sofie his precious dog. I absolutely love the way this card came out! So the Details on this card. 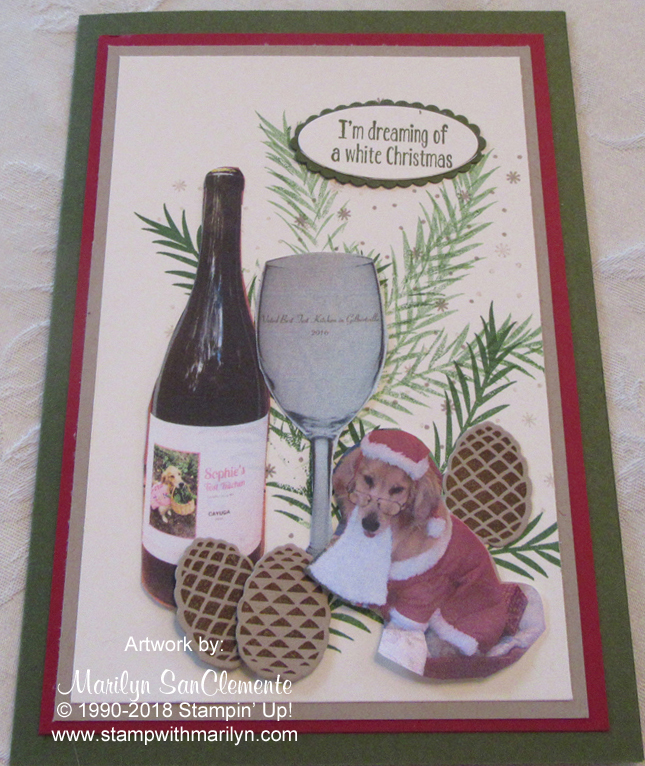 This card is 5 X 7″ since I had to enlarge the wine bottle and wine glass to be able to read the labels. The card base is a 10″ x 7″ piece of Mossy Meadow cardstock scored at 5″. The next layer is a 4 1/2″ x 6 1/2″ piece of Real Red cardstock. The next layer is a 4 1/4″ x 6 1/4″ piece of Crumb Cake cardstock and the last layer is a 4″ x 6″ piece of Very Vanilla cardstock. The Pine boughs are stamped using Garden Green ink on the background of the Very Vanilla cardstock. The star background image is stamped with Crumb Cake ink. Next I stamped the pine cones using Soft Suede ink on Crumb Cake cardstock. The pine cones were cut out using the coordinating Pretty Pines Thinlits dies. The wine bottle and wine glass are actually prints of the bottles of wine and wine glasses that Steve had made for his dog. I had tried to superimpose the image over the stamped image from the Half Full stamp set – but then you could not read the label on the bottle or glass. So the Half Full stamp set was actually used for inspiration rather than using the actual stamped images. Last is an image of precious Sofie in her Santa outfit. What a little cutie! I actually did use the sentiments from the Half Full stamp set for the front and inside of the card. 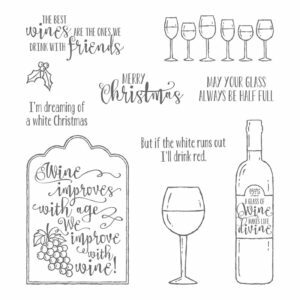 I stamped the sentiment “I’m dreaming of a white Christmas” on the front of the card and layered this onto a scalloped oval cut from Mo ssy Meadow cardstock. The sentiment on the inside is ” but if the white runs out, I’ll drink red” with an additional personal sentiment from Steve and Sofie. This is one of my favorite custom cards that I have made. Here is another sample of the card that I made using Crumb Cake cardstock as the card base. Which one do you like better? 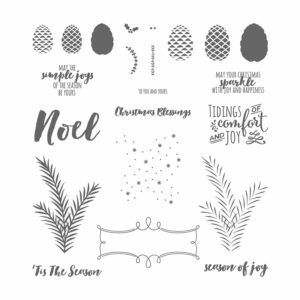 Christmas Pines stamp set, Half Full Stamp set. Bookmark.